The Brocade VDX 6740 and 6740T are Ethernet fabric Top of Rack (ToR) switches featuring 10 GbE ports with 40 GbE uplinks. 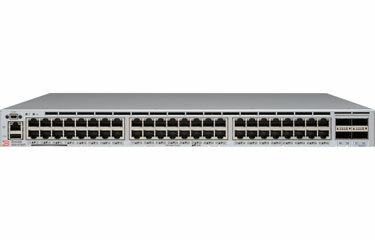 The new Brocade VDX 6740T-1G Switch offers dual-speed functionality. It can be deployed with1000BASET for existing 1 GbE server connectivity and upgraded via software to 10GBASE-T for future bandwidth growth. Together with Brocade VCS Fabric technology, these switches deliver the high performance and low latency needed to support demanding virtualized data center environments. Brocade VDX 6740 Switches provide the advanced feature set that data centers require. Together with Brocade VCS Fabric technology, these switches can simplify network design and operations for a more automated and efficient network, offer the flexibility needed to easily scale networks, and provide a cloud-ready infrastructure. High performance and low latency: Provides high performance with 10 Gigabit Ethernet (GbE) access ports and 40 GbE uplinks, as well as ultra-low latency through wire-speed ports and automated hardware-based Inter-Switch Link (ISL) trunking. Flexible bandwidth options: Offers flexibility to deploy 1000BASE-T and upgrade to 10GBASE-T for higher bandwidth. Simplified architecture: Simplifies network architectures and enables cloud computing with Brocade VCS Fabric technology. Maximizes network utilization: Enables efficient, load-balanced multipathing at Layers 1, 2, and 3, including multiple Layer 3 gateways. Advanced storage connectivity: Provides Ethernet storage connectivity for FCoE, iSCSI, and NAS. Optimizes virtualization: Offers the automation needed to support highly virtualized server and storage environments while enabling the transition to cloud computing. The Brocade VDX 6740, 6740T, and 6740T-1G, with VCS Fabric technology, provide unique features for building access-layer fabrics optimized for The On-Demand Data Center. High Performance: With up to 10 GbE connections, 40 GbE uplinks, and up to 160 GbE trunking, the switches deliver high performance computing and reduce congestion. Low Latency: The switches deliver very low latency through wire-speed ports and offer deep buffers to provide the buffering capacity to handle increases in traffic. Storage Connectivity: Each switch supports multiple storage connectivity options, including FCoE, iSCSI, and NAS storage. Unmatched Simplicity and Automation: VCS Logical Chassis, self-forming and self-healing fabrics and Auto Fabric provisioning simplifies operations and streamlines configuration. Maximum Efficiency and Resiliency: Optimized east-west traffic and multipathing across layers 1 – 3 creates a flexible network that adapts to changing business conditions and traffic patterns. Optimized for Virtualization: A variety of features support virtual machine mobility and eliminates the need to manually configure port profiles. Support Cloud Computing: Unify your virtual and physical architectures with the VCS Gateway for NSX and provide secure multi-tenant support with Virtual Fabric. The Brocade VDX 6740, 6740T, and 6740T-1G operate seamlessly under the Brocade Vyatta Controller. This controller is a quality-assured edition of the OpenDaylight controller code supported by an established networking provider and its leaders within the OpenDaylight community. Older, legacy data center networks are characterized by a rigid hierarchy with access, aggregation and core layers. This model does not allow for changing traffic patterns and limits network utilization. It has limited support for server virtualization and cannot facilitate operations such as virtual machine mobility.